Whenever we accidentally hit the Explore tab in Instagram, we're generally greeted with a grid of painted fingernails, umpteen celebrity selfies and, on a good day, the occasional pretty face or pleasant sunset. Now the Facebook-owned app is attempting to revive the feature and make it more relevant to every day users by introducing personalised photos and videos, based on content people they follow have liked. 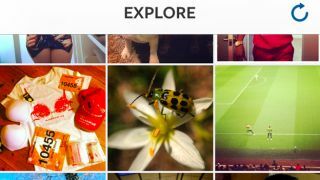 If, for example, users enjoy tracking photos from their hometown, the Explore tab might now serve up a snapshot of the area at any given time. Acknowledging the update on his personal Facebook page, Instagram Co-Founder Mike Kreiger said: "If it's been a while since you checked out the Instagram Explore page, give it a whirl; the team's been working on incorporating personalised content in there now, too." A Facebook spokesperson also acknowledged the change, explaining that the personalised content will still be mixed in with trending content. The company added: "We're always looking to update the types of posts you see in Explore to better tailor it to you. We'll show you a variety of photos and videos that people you follow have liked, as well as content that is trending in the Instagram community." The change gives Instagram an opportunity to differentiate itself from Vine. It's explore tool is focused on drawing users attention to the most popular content on the surface at any given time. Right now, it's annoying high school kids. Opinion: Is Instagram Direct just following the crowd?